Racing Beat offers a wide selection of Mazda3 performance parts for a range of models. Among the more popular upgrades with Mazda3 owners are intake, exhaust and suspension modifications, we invite you to review our Mazda3 parts listing and contact with us with questions regarding our Racing Beat Mazda3 parts. We're amazed at the performance potential of the Mazda3; our experience has shown that this chassis is very responsive to aftermarket upgrades and modifications. What are you waiting for? Get started on your upgrades today! Forged And Getting Stronger – They’ve arrived! Good news for our widely popular ball-joint sway bar end link housings! 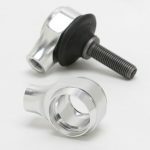 While our sway bar end link kits that contain these housings have been incredibly popular, we’ve struggled to keep these on the shelf due to the laborious two-step manufacturing process. We’ve FINALLY sorted it out with a new vendor, but in the process it yielded an unexpected bonus, the new housings will now be produced using a stronger, forged aluminum housing! Even better news….they’ve arrived and are back in stock! The new 2018 Mazda 3 models are in the showrooms and we’ve confirmed fitment of the Racing Beat Exhaust systems on these new models. We have exhaust systems available for both the sedan and 5-Door HB versions, these systems have proven to to very popular with Mazda 3 owners over the years. Super sounding – deep, low growl, without any harsh or droning tones. Who better to give you a tech-talk than Mazda's own tech guy and RB friend, Dave Coleman! Discover the inner-workings of the Mazda3 Skyactiv application. Adding a set of swaybars to your Mazda3 is a great way to improve handling. We've answered some of your most popular swaybar questions in this guide. Improve the handling of your Mazda 3 with a set of Racing Beat bars. NEW! These sport-tuned Koni shocks are intended for use on lowered street vehicles - great ride and performance. Cat-back Mazda 3 exhaust system for the 04-09 Mazda 3s 2.5l Sedan.